When Mom, Sharon, and I are in the same zip code, our time together is rarely an opportunity relax. With a blog, an upcoming book, and biannual Potluck events, we must also take time to work. Whether developing a recipe for Three Many Cooks, working on content for the last chapter of our book, or planning out flavors for the ice creams we’ll serve at an upcoming event, we’re always doing a little work mixed with a little play. A few weeks ago when Sharon was in town, we had a photo shoot with the incredibly talented William Taufic (we just called him Bill). He’s a talented photographer – his photos are bright, rich, and beautifully composed – but he’s talented in another way too: he made three women feel great about themselves! At the end of the day, we were amazed that there were actually a few pictures where we all said, “I look great!” This is a masterful feat. 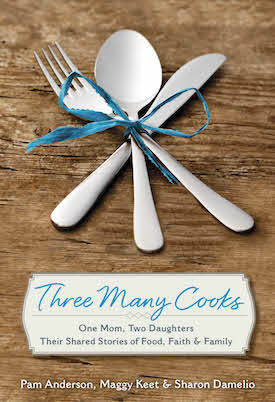 Here are some of Bill’s images, which will be used to promote our memoir, Three Many Cooks: One Mom, Two Daughters, Their Shared Story of Food, Faith, and Family out on April 7, 2015. After a productive morning, we decided to break for lunch. (Smiling for a couple hours is hard work!) I’d brought a bag of fresh tomatillos from my CSA and asked Mom if we could make something like a posole. With a rotisserie chicken in the fridge and three of us prepping, we worked up a simple recipe and had this soup simmering on the stove in fifteen minutes. Shortly thereafter, we sat down with Bill and Dad to dig into this Simple Posole, which we served with a little leftover homemade focaccia on the side. I’m not sure if Bill was just trying to make us feel as good at the table as we did in front of the camera, but he emphatically pronounced this Simple Posole: “the greatest thing I have ever eaten!” Needless to say, we love Bill. And we love the beautiful photos he created of us. Don’t let not having fresh tomatillos stop you from making this soup. You can simplify the recipe by substituting a 16-ounce jar of salsa verde for the tomatillos. Bring tomatillos and 1 cup of water to boil in a medium saucepan; reduce heat to medium-low and simmer until tender, 8 to 10 minutes. Drain and transfer to a food processor and purée. Meanwhile, bring broth and water to a simmer over medium-high heat in a large soup kettle, separate chicken meat from bones and skin, adding bones and skin to the simmering broth. Reduce heat to low, partially cover, and simmer until bones release their flavor, about 20 minutes. Strain; reserve broth (you should have about 6 cups) and discard bones and skin. Return kettle to burner set on medium-high and heat oil. Add onion; sauté until tender, about 5 minutes. Add cumin, oregano, garlic, and jalapeno; continue to cook until fragrant, a minute or so longer. Add 6 cups of broth, chicken, tomatillos, and hominy; simmer to blend flavors, about 10 minutes. Stir in cilantro and serve with tortilla chips and lime wedges served separately. WOW! Terrific pictures………and the soup sounds good too! William’s photos are beautiful! The three of you look vibrant, warm, & inviting. For that reason, I look forward to purchasing your book upon its release. Plus, I love seeing mothers & daughters working together! Be blessed Pam, Maggy, & Sharon! Photo shoots are hard work! I’d much rather be in the kitchen making this soup than standing in front of the camera. Proof, I guess, that I’m a cook, not a model. I loved Bill’s line that he repeated throughout the day to keep us all smiling. “I love my job,” he said. Come to think of it, I love my job too, especially when I get to hang in the kitchen with you two! I’d say Mr. Taufic easily earned his bowl o’soup with those breathtaking photos! Can’t wait for the upcoming Anderson book woohoo! (Will there be recipes in the memoir??) 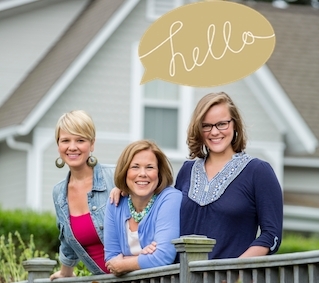 You ladies have one of the most warm, inviting blogs out there! Thank you! Thrilled about this for you!! How very very lucky you all are to have a working relationship with one another. I use the term ‘working relationship’ to encompass all aspects of what that means besides the mere the obvious. Wonderful photos—-a homey recipe—-and good fortune to you all in regard to your multiple endeavors. You ladies radiate beauty from the inside out! Thanks for the salsa verde tip. Helpful for those of us who need to cut corners. Can I also use 2 quarts of chicken broth instead of simmering the bones? Or, will that make the flavor too intense? Thanks! Hey Shannon, you can totally use 2 quarts of broth rather than simmering the bones. Enjoy! Delicious recipe! Only thing I’d recommend is cutting back on the jalapenos if using the Salsa Verde shortcut. I made a delicious, but VERY SPICY soup this weekend. Luckily we eat hot so it didn’t go to waste, but it was spicy!! Also your pictures are gorgeous!! I found this posole recipe on Pinterest, and have since probably made it a dozen times (just made another batch right now). We love it, and I’m so glad to have found your beautiful blog!